TRAILHEAD ACCESS: From 1-90 exit 62, go northeast to Kachess Camp­ground, north in the campground to road’s end at the trailhead. PARKING AND FACILITIES: All normal campground facilities are available near this trailhead. There is parking for 15+ vehicles at or near the trail head. 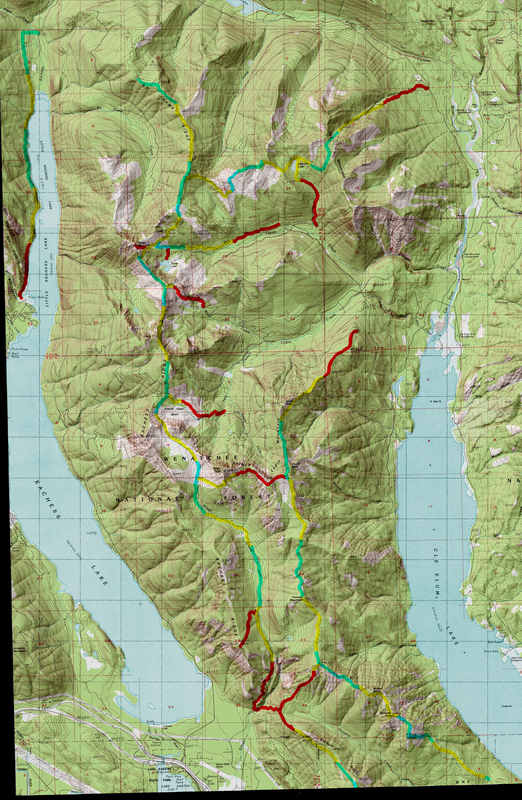 SETTING: Lake, streams, riparian zones, glaciated rock, large old-growth trees, valley bottom. OPPORTUNITIES:	Hiking. scenery, fishing, wildlife, camping, boating. OTHER TRAILS: Kachess Lake Shore #1302 and Kachess Nature #1395 within Kachess Campground, Mineral Creek #1331.